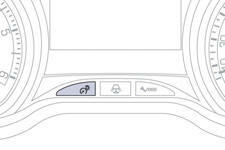 System for the manual adjustment of the brightness of the instrument panel and touch screen to suit the ambient light level. 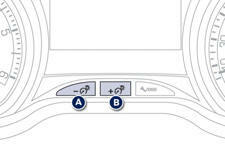 With the headlamps on, press button B to increase the brightness of the instruments and controls and the interior mood lighting or button A to reduce it. As soon as the lighting reaches the required level of brightness, release the button. press the button to adjust the brightness of the instruments and controls, release the button when the desired level is attained. When the vehicle lighting is off or in day mode (daytime running lamps on), pressing the button has no effect. Press MENU to display the "MAIN MENU" then select "Settings". Select "System Configuration" then "Brightness". Press "Turn off screen". The screen goes off completely. Press the screen again (anywhere on the surface) to activate it.